During these early years of forming our family's annual traditions, we've have some hits and some misses. Our biggest challenge, however, has always been the holiday travel season. On the one hand, we want to be with our extended family, celebrating with those whom we don't get to see as often as we'd like. On the other hand, we feel the need for both our own traditions and a focused observance of the Advent season, yet find that our travels often interrupt our attempts. We have our traditional Advent wreath, but those last candles never get lit. We have our beautiful Advent/Lent candle spiral, but again, it doesn't travel well and poor Mary never quite reaches her destination before we leave. We never get everything hung on our Jesse Tree; the story is often left unfinished. So what does work? Fortunately, we've had some happy successes. Two years ago, we strung our wall with bright red envelopes, each one containing the day's preparatory activity. The events ranged from decorating to baking to service and more. When the time came for us to leave for our holiday travels, we simply took the remaining envelopes along with us. Because we knew in advance when we'd be leaving, we included those days in our envelopes, along with a simple activity for each day we'd be away. Another fun yet portable Advent calendar is this Advent in a jar idea. Write your Advent activities on slips of paper, glue a colourful felt ball or pom pom onto each paper, then fold and keep in a jar. Easy to assemble, easy to bring along on your holiday travels. A Jesse Tree is a type of Advent calendar which combines daily readings with corresponding symbols, walking through the Story from the garden to the birth of Christ. One of our most valued gifts has been a felt Jesse Tree storyboard handmade by the children's Oma. Rather than hanging the Jesse Tree story pictures on a tree, as is traditionally done, the felt pictures stick onto a large pocket of felt. The felt pocket houses the daily readings and extra pictures, making the entire package simple to bring along as we travel. Other portable Jesse Trees could be made with individual pockets, envelopes, magnets, flaps, or velcro. Ann at A Holy Experiences offers a beautiful free Advent Family Jesse Tree devotional (both readings and the corresponding illustrations), which can be used as a basis for creating a portable system that works for your family. Another option is to forgo the tree altogether. While we do enjoy our portable Jesse Tree, some years even that feels like too much. 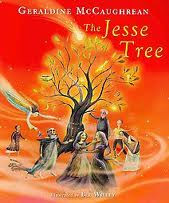 Fortunately, Geraldine McCaughrean has written a lovely book, The Jesse Tree, which tells the Jesse Tree stories within the larger narrative of a conversation between a carpenter and a boy. The aforementioned Advent Family Jesse Tree devotional could also be used sans ornaments, as well as several other Advent and Jesse Tree devotional narratives. Make it a family read-aloud as you drive to your destination, a nightly bedtime story, an after-dinner ritual, or whatever works best for you and your family. Another treeless and portable Advent family observance is this Advent reading plan designed for use with the Jesus Storybook Bible (our favourite children's Bible). With twenty-one Old Testament stories (each ending with a paragraph that points to Jesus) and three stories encompassing the birth of Christ, this is the perfect twenty-four day plan to encompass the Advent season. There are also, of course, countless adult-oriented Advent devotionals, which afford high portability for your own personal Advent reflections. This year I am reading through the Advent devotional Watch for the Light: Readings for Advent and Christmas, which includes daily writings from individuals such as C. S. Lewis, Kathleen Norris, T. S. Eliot, Dorothy Day, Henri Nouwen, Madeleine L'Engle, and more. Find one by your favourite author, or choose an Advent Bible reading plan instead of (or alongside) a separate devotional. Above all, keep it simple! However you choose to observe Advent, let the season be a time of calm focus and inward preparation rather than another source of stress and busyness amidst your holiday travels. Do you have a favourite Advent devotional? unique method of combining Advent observances with holiday travel? other travel-friendly holiday traditions? Share your ideas or links below!